There are pros and cons for both the rental and purchase of your propane tank that should be taken into consideration when deciding for your propane needs. There are many factors involved in this decision as individual circumstances vary widely but hopefully the following outline willl help in determining which option fits best for you. In both decisions the tank size is the most one important factors and needs to be sized correctly to supply the demand of the propane appliance. 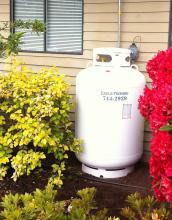 Buying a Propane Tank - You have two options in the decision of purchasing a propane, new or refurbished. A refurbished tank is a used tank that has been recertified and passes requalifications, in most cases the tank valves have been replaced and the tank has been repainted. A refurbished tank has the same life expectancy as a new tank and will need to be requalified every 10 years. The life of a propane tank can vary as the environment it is subject to and maintenance required plays a major role in how many times it can be recertified, for example a tank located close to the ocean will experience more corrsion of the metal and will require more maintenance. When purchasing a propane tank you are taking on the responsiblitly of maintenance which includes and is not limited to; rust protection and paint, valve replacement, and requalifications. One of the primary advantages of buying a propane and owning the propane tank is that the customer can purchase propane from which ever supplier they choose. In choosing to purchase the propane tank the length of time you are planning to own your house will be a factor, as the next owner will not be burden with acquiring propane service as the tank is apart of the sale. Propane Tank Rental - Renting the propane tank is an option that many potential customers choose provided certain requirements are met. These requirements include and may depend on the following; the type of appliance and total BTU load of appliances, approval of credit appliaction and rental agreement, all necessary gas permits on appliances, the purchase of fuel supplied to tank. Eagle Propane Sales maintains rental tanks in accordance with industry standards and conducts regular inspections of the propane tanks, in doing so Eagle Propane's service technician will require access to the tank for these inspections.